Armadillos are small New World mammals often called speed bumps for their habit of crossing roads too slowly, and they carry their own suits of armor around with them. And that's just the beginning of what makes these animals really, really interesting. 1. The name armadillo came from the Spanish terms meaning “little armored one.” They eat grubs and insects, small reptiles, worms, and sometimes plants. They have a keen sense of smell but poor eyesight, which is common among animals that dig in the dirt. 2. You can eat armadillo, called “possum on the half-shell,” or, during the Great Depression, “Hoover hogs.” They are said to taste somewhat like pork. Find some recipes for armadillo meat at Eat the Weeds. 3. The giant armadillo (Priodontes maximus) is the biggest species of armadillo, growing up to 39 inches long. 4. The pink fairy armadillo (Chlamyphorus truncatus) is the smallest of the 20 or so armadillo species, growing to only about six inches long! It is found in central Argentina. These tiny ‘dillos have pink armor and feet, and fluffy white fur. By the way, most armadillos can grow hair, particularly on their undersides, but most have sparse, spiky hair. 5. The screaming hairy armadillo (Chaetophractus vellerosus) can be found in Paraguay, Argentina, and Bolivia. As its name might suggest, the animal has long hair growing out from between its armor scales and screams loudly when threatened. 6. The Brazilian three-banded armadillo (Tolypeutes tricinctus) and the southern three-banded armadillo (Tolypeutes matacus) are the only armadillo species that can roll themselves up in a ball. Both are found in South America. It had to have been one of these species that inspired Rudyard Kipling's Just So story "The Beginning of the Armadillos,” in which Kipling wrote that armadillos were created when a turtle and a hedgehog taught each other how to defend themselves by growing armor and rolling up in a ball. 7. The three-banded armadillo was the mascot of the 2014 World Cup tournament in Brazil. Because it curls up in a ball, see? 8. The nine-banded armadillo (Dasypus novemcinctus) is the only species common in the U.S. It ranges throughout the American South, from Texas to the Atlantic and as far north as Nebraska. It is also common in Mexico. Though their name would suggest otherwise, nine-banded armadillos can have anywhere from seven to 11 bands in their armor. 9. Nine-banded armadillos always give birth to identical quadruplets. That’s a litter of four developed from a single fertilized egg. 10. The armor that an armadillo carries around is tough and then some. In April of this year, Larry McElroy fired a 9mm pistol at an armadillo in his yard in Georgia. The bullet ricocheted off the animal’s armor and into a mobile home belonging to his mother-in-law, 100 yards away. The bullet went into the back of the recliner McElroy’s mother-in-law was sitting in. She was taken to a hospital with minor injuries; the armadillo did not survive the encounter. Then, in July, a man in Cass County, Texas, attempted to shoot an armadillo and ended up shooting himself in the head when the bullet ricocheted back at him. Or at least, those were the stories both shooters told the police. 11. Armadillos are the only animals besides humans that are affected by Hansen’s disease, also known as leprosy. 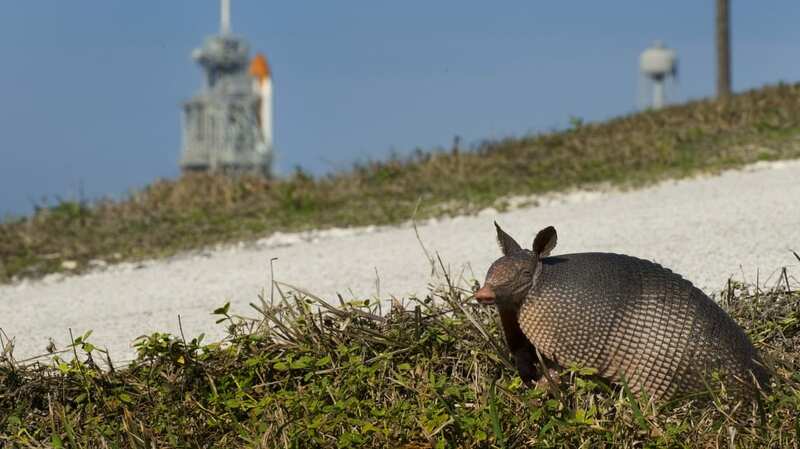 Nine people in Florida have tested positive for leprosy this year; all report encounters with armadillos. However, it’s not a situation that should cause panic. There are normally 150 to 200 cases in the U.S. every year, and Hansen’s disease is quite treatable if caught early. There are also millions of armadillo encounters, but since 95 percent of people are already immune to leprosy, the odds of catching it from an armadillo are small. 12. Armadillos may be brave and determined, but they aren’t known for their intelligence. This critter in Jackson, Mississippi, recently found himself in a deep, underfilled water fountain outside City Hall. The videographer was rather far away, so the camera doesn’t stay steady. He manages to get out, but can he stay out?